No one wants vulnerable people -- like children, the elderly and veterans -- to go hungry. But one in six children in the United States — about 13 million — don’t know where their next meal is coming from. That’s enough students to fill 180,555 school buses. Women United — a global, growing force of 70,000+ women dedicated to creating a world of opportunity — is fighting to make sure these children have enough to eat. That’s why Women United leaders are joining together on Thursday, Sept. 20 to advocate for the federal Supplemental Nutrition Assistance Program, or SNAP, which helps working families keep food on the table during tough times. Nutritious food helps people stay healthy, so it’s easier to get and keep a job and take care of their families. Kids who have a healthy diet do better in school and have higher graduation rates, while older Americans who receive SNAP benefits can better afford their prescription medications on their fixed incomes. SNAP cost-effectively makes food accessible to hungry families at a scale no independent nonprofit can match. For example, Feeding America, the nation’s largest domestic hunger-relief organization, distributes 4 billion meals each year. For every meal provided by the Feeding America network, SNAP provides 12. United Way raises $3.5 billion each year across America. A 5 percent cut in SNAP, a $65 billion program, would be equivalent to eliminating United Way’s entire footprint. Currently, Congress is debating the Farm Bill, which will determine the future of SNAP. The bipartisan Senate bill would strengthen SNAP, while other proposals would make drastic cuts. These cuts will hurt families who are working or seeking work, forcing them to skip meals or put their children to bed hungry. 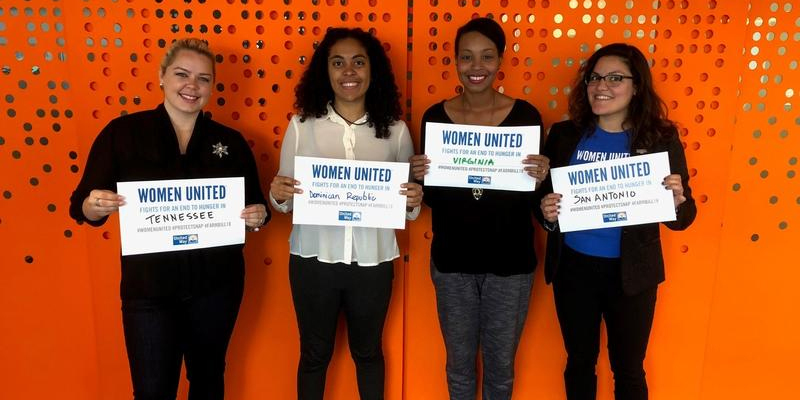 Join Women United and fight to end hunger. Encourage your lawmakers today to work across party lines to strengthen SNAP and protect working families, children, veterans and seniors. Congress should not force people to choose hunger. Share a photo on social media of where or how you’re fighting to end hunger using the template below.